Babies can get expensive. Between doctor appointments, diapers, and all of the “little things” that you have to purchase regularly, the first year alone can cost you thousands of dollars. Thankfully, there are ways to get free baby stuff to help save money on what you need for your child. 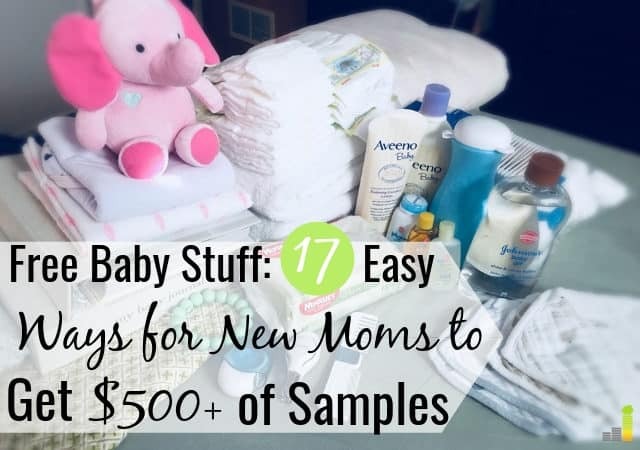 If you’re an expecting parent, or if you just want to start saving more of your money while taking care of your baby, there are a lot of ways to get free baby samples and keep more money in your pocket. Having a child is a joyous part of life; however, that precious bundle of joy comes with a lot of costs. Companies know this and often offer free baby stuff by mail and in-store to help you get essential items to care for your baby. They do this hoping to gain your future business. Each program is unique, but most of the times getting free samples is simple and can be done rather quickly. If you’re expecting a new infant, or have a newborn, we’ve created a list of free baby stuff you can use to save money. You can sometimes get those expensive goodies that you wouldn’t have purchased in-store, which means you get to try them without spending your money. But how can you get free sample boxes for your new baby? An Amazon Baby Registry is a great place to start to get free baby stuff by mail. Not only does a registry help you see what you need to get for the new baby, but friends and family can shop from there if they want to buy anything. On top of the baby freebies, the box ships for free. And, to top it all off, if you complete your registry on Amazon, you can get a 10-15 percent completion discount and order anything else you can think of for a reduced cost. Along with Amazon, making a Target Baby Registry is another opportunity to get free baby stuff online. As soon as you sign up with a registry, you can redeem your welcome bag, which you can grab by going to your local Target’s guest services counter. While Target doesn’t specify what is included in your welcome bag, you will receive up to $100 worth of samples and coupons. Just like Amazon, Target also has a registry discount of 15 percent. Unlike Amazon, Target’s discount starts eight weeks before your baby’s specified due date, and you can complete your registry and grab whatever was left with the discount. Pretty sweet! Walmart is the ultimate inexpensive retailer to buy your baby goods and to create a registry for family and friends who want to purchase something for the new baby. When you create a Walmart baby registry, you receive a welcome box with samples and products for both you and the baby. The Walmart welcome boxes run out quickly, so be sure to sign up so you receive one as soon as they’re restocked. Any parent of newborns knows just how expensive diapers can be for a growing baby. There are ways you can reduce cost and save money. Here’s how to get free diapers for your baby. If you’re an Amazon Prime member, not only will you be able to get extra discounts on your baby registry, but you’ll also earn discounts and credits to get free diapers. If $1,000 in purchases have been made and shipped from your baby registry, you’ll receive a $100 credit. When you join Amazon Family, you’ll get up to 20 percent off diapers, baby food, and more. Amazon Family is completely free as an added feature of Amazon Prime, so you can use it at any time. If you’re not an Amazon Prime member, you can sign up for a free 3o-day trial to test it out. They do this while still offering advanced leak protection. With the sample box, you’ll receive five diapers and ten wipes, and you only need to pay the $5.95 shipping and handling fee. If you love the diapers and wipes samples, you can then sign up for their delivery service and choose how often you want diapers and wipes sent to your door. There are different ways to get free diapers, but the National Diaper Bank Network is a great resource for anyone who has difficulty buying diapers for their baby. The National Diaper Bank Network is a nationwide non-profit that offers families living in the United States free diapers. If you are a low-income household and believe you won’t be able to afford them for your baby, the National Diaper Bank Network connects you with local organizations that can provide you with free diapers. Just like diapers, baby formula can cost a small fortune in baby’s first year. Sometimes, whether through nature or choice, breastfeeding is simply not an option. But formula can cost up to $1,500, depending on the formula purchased, according to the U.S. Department of Health and Human Services. For many parents, that number is terrifying, but there are ways to get free baby formula. Many doctors work with and market certain formula companies, so ask your doctor for free samples of baby formula. Some doctors will even give you full-sized formula containers if you ask. For example, when my daughter turned two months old, I wasn’t able to produce enough milk to keep breastfeeding. I told her doctor that we would start supplementing with formula, and she gave us three 12 oz containers of different formulas to try. This lasted us well over three months in addition to my breastfeeding. And it was free! When you sign up for Enfamil Family Beginnings, you’ll receive up to $400 worth of samples, coupons for free formula, and other goodies. It’s completely free to join, and you’ll even have the opportunity to win free formula for a year. When you sign up for Similac StrongMoms Rewards, you’ll receive up to $400 worth of samples, coupons for free formula, and you can also get rewards and discounts through their partnership with the Pampers Diapers Club. It’s free to join, and you also receive nutritional guidance. When you sign up for Nature’sOne Sample Program, you’ll receive, for free, one 12.7 oz container of the formula you choose. All you have to do is pay the shipping and handling fee of $5.95. There is a limit of one container per household, so make sure you grab the one you really want to try. By age three, nearly 85 percent of a child’s brain core structure is formed. That is one of the ultimate reasons you should read to your child, even before they’re old enough to read themselves. And did you know that you can receive free baby books to read to them? You can use your Kindle or download the Kindle app on your phone or tablet to access free eBooks for your child. Although some books do cost money, you can filter the children’s book section to find those that have been marked free and download them. You can access these books at any time as long as you have your account. While the Dolly Parton’s Imagination Library isn’t currently available everywhere in the United States, it is a great program to get free baby books. Once you enroll your child in the program, they will receive a free book every single month until they are five years old. You can start the program as soon as your child is born. That means your child can receive 60 free books. You can use their website to check if you live in it’s available in your area. As soon as you visit the website Babies First Books, they will ask you for a promotional code to receive five free books (a value of up to $40) of your choice. All you have to do is enter the code OFFERS, and you can get them for free. If you want more than five books, you will pay an additional $3 per book. Not bad! There are countless other resources to get free baby stuff for expecting mothers. Here’s a list of just a few items you can get for free. Did you know that parents in Finland receive a free baby box to put their sleeping baby in? It’s also no coincidence that Finland has one of the lowest infant mortality rates in the world. Due to its popularity overseas, the company The Baby Box Co. also offers parents in the US the opportunity to earn a free baby box for their infant to use. All you have to do is sign up, complete the free baby courses (which are only 15 minutes long for each course), and enter in your address to receive your free baby box. There is limited program availability in other states. Babies are so cute in leggings, and you can get $50 worth of baby leggings for free by going to Baby Leggings and entering in the promotional code SPRING50. You can even choose any pattern you wish! If you want to carry your baby around easily, you can grab a free sling through Seven Baby. Just enter in the code FREESLING4ME and get a sling worth $40. You will have to pay for shipping and handling, but that’s a small price to pay for a free sling. You can also choose the pattern you want. Plan on nursing your baby? Get comfy and cozy with a free nursery pillow from Nursing Pillows. Worth $40, you can get a pillow for free by using PJBABY. You’ll just need to pay for shipping. As with the other free products, you get to choose which pattern you want on the pillow. Babies can be expensive, but it is possible to save money on your child. 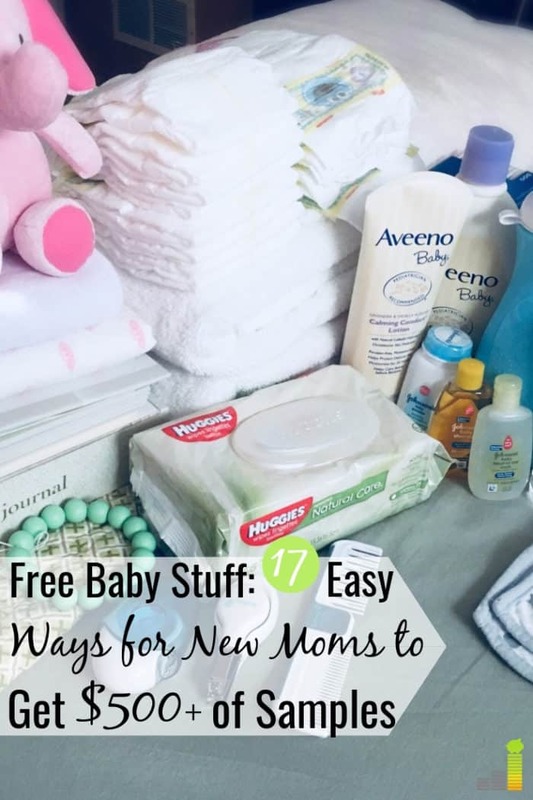 One of the best ways to do that is to to get free baby stuff. You can even take this list a step further. Reach out to the brands you love the most and ask for coupons or discount. They might say no but you never know unless you try. Free baby stuff is all around you; you just have to know where to look. What are ways that have worked for you to get baby freebies? Why do you think people believe having children is so expensive? What is one of your favorite ways to save money raising children?